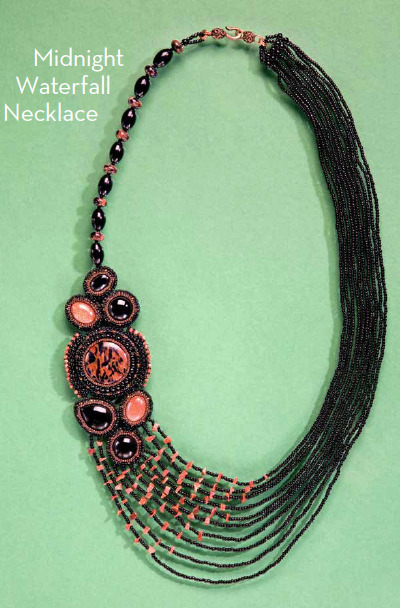 Project jewelry books are wonderful sources of inspiration and instruction for the self-learner. Reference guides though offer much more as they lay the groundwork for original designs of our own. It was therefore no surprise to learn that this book, which I received for review, has become a bestseller since its publication in 2011. 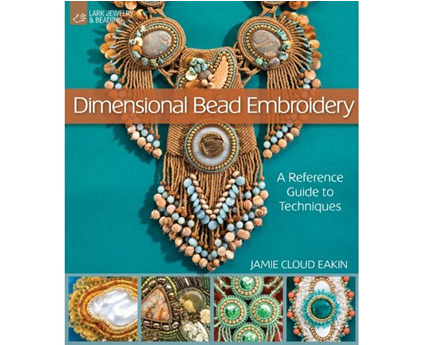 Jamie Cloud Eakin, the author of Dimensional Bead Embroidery: A Reference Guide to Techniques has been a professional bead artist for nearly 20 years. So her experience is telling in her instructional book. The book starts with Materials and Tools, Basic Techniques, Getting Started and Designing and Components where she covers such details like how to prepare pin backs, how to create flat bases for uneven components and the different ways to deal with donuts and holed pendants. Jaime also includes 9 projects with detailed instructions at the end of the book such as the Classic Chic Earrings shown above and the Midnight Waterfall Necklace. Most of the book though is devoted to different stitches that help build up bead embroidery projects. The variety offered is exhaustive and will do much to inspire beaders. What is astounding is her sheer creative output - every stitch type is illustrated with 3 or more inspirational designs showing its use! Jaimie said, "I find that many people who do bead embroidery tend to use the same techniques over and over again. 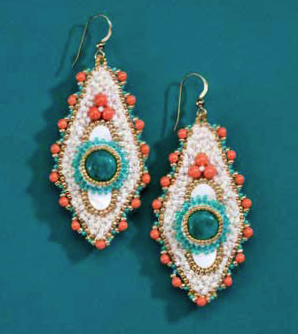 These books give you more options for design — and for beading fun." 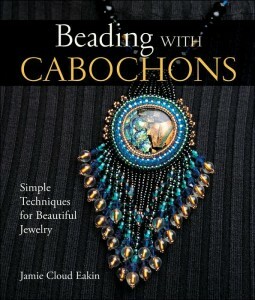 Her other book Beading with Cabochons: Simple Techniques for Beautiful Jewelry also makes use of a wide range of stitches. "So, I created a kind of cross-index of stitches in both books that shows a picture of the technique results, which book each one is in. and the corresponding page number." Most of the free pdf download of this index is shown below. It is clear from this list that using many and not just a few of these stitches will enrich bead embroidery designs. This reference book is a must-have that is a must for any one who loves making bead embroidered jewelry designs. It will join my favorite books list for sure! I Love this book. So inspirational and easy to follow and understand. Thank you Pearl. I do want to try my hand at bead embroidery this year, and it's obvious that this is a must have book for a successful endeavor! I love, love, love her work! I have her first book so this new book is a must. I often see her work in Margie Deeb's color reports and always love the colors she combines.